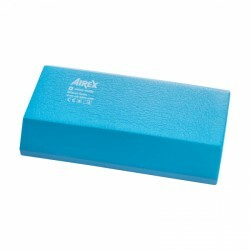 The Airex Balance Trainer Beam Mini is a new product of the brand Airex. It is of blue colour and the dimensions are 41 * 24 * 6 cm. It is the smaller type of the original Balance Beam. The smaller version offers the advantage of being very handy and light thanks to its size. It is easy to clean and has an anti-bacterial equipment by Sanitized. Due to the closed cell foam, neither water nor dirt soak in the Balance Beam Mini. The Balance-Beam Mini can be multi-functionally used - indoor, outdoor, and even in water. The Airex Balance Trainer Beam Mini is made of a soft foam by Airex, which is REACH conformal. The foam slackens whereby the body is permanently demanded and trained. Due to the balance training, further muscle groups are activated, which are also responsible for the stabilisation of the joints. Due to the training with it, the deep muscles are trained as well. It has a shape like a common balance beam, which is especially designed for clinical balance and proprioceptive exercises. In addition, the Beam Mini is ideally suitable for a workout of strength, cardio, and balance.